When I think about empathy it’s always as opposed to sympathy; sympathy is often wetter, patronising sometimes, and more open than it’s safe to be. Sympathy can be an excuse to make a situation about ourselves. Empathy, on the other hand, is understanding. Empathy is hard work because it starts from the outside and works in. How to reach this place, and why it might be so important to strive for, is at the heart of Leslie Jamison’s 2014 collection. Although there is not one singular route towards this place, and this multiplicity is illustrated with a playfulness in form throughout these eleven essays. 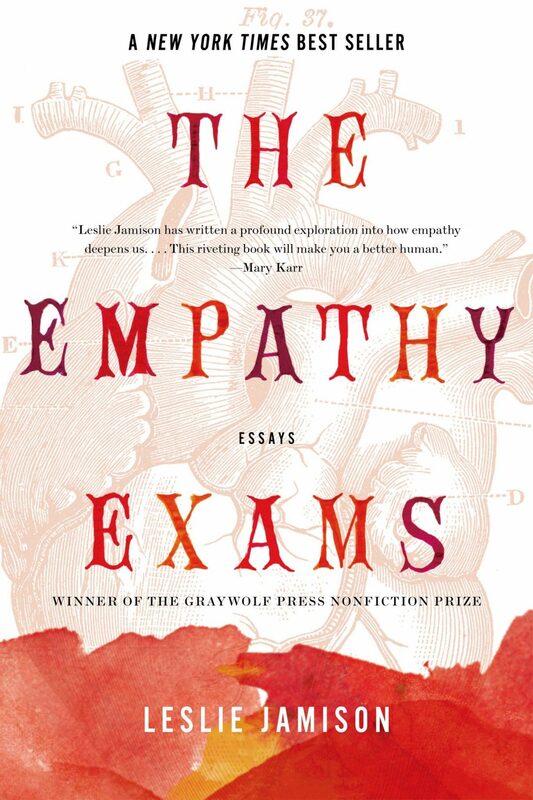 Beginning with the eponymous ‘The Empathy Exams’, Jamison merges the narrative of training materials to assess a doctor’s ability to empathise, with her own experiences of communicating with medical professionals. Text, memoir and imagined doctor’s notes form an exploration of the fictional (but plausibly real), standardised patient ‘Stephanie Phillips’. This sits alongside Jamison’s failed surgery to correct a supraventricular tachycardia and her experience of having an abortion. Deeply personal and wholly engaged with the gender politics inherent with medical care, Jamison’s deftness in navigating different registers makes her own ‘standardised patient case summary’ which comes at the end of this essay both affecting and thought-provoking, characterising the effort involved in reaching out. As Jamison writes, empathy is a choice we make to “pay attention, to extend ourselves”. This playfulness continues in ‘Morphology of the Hit’ where Jamison takes the story functions outlined by Russian scholar Vladimir Propp in his analysis of fairy tales, to consider the experience of being violently mugged in Nicaragua. The experience both does and doesn’t fit with Propp’s understanding of the fairy tale, and to layer this theory over herself and the event becomes an act of defiance, as well as one of resignation. The form both helps and hinders an exploration of this violence, at once giving it order which strives for meaning or purpose, until it becomes clear that Propp’s structure cannot possibly provide meaning to an act which evades comprehension. This wrestling manifests itself through tacit acknowledgement of the essay form’s wavering edges. With a broken nose and bloodied face, Jamison goes to the local police station, “a ratty building with brown stains on the walls and a broken toilet you could smell from all the other rooms. Or someone could, at least. I couldn’t smell anything.” This example of essay as truth but not always as unsurpassable fact becomes a way in to empathy itself, and the creative leaps required to understand another person’s experience. The notion of tourism as empathetic endeavour is explored in ‘Pain Tours’ and ‘La Frontera’, where language becomes a bridge which can be used to cross over in to another person’s world. But Jamison’s Spanish is flawed and so she knows when she speaks to people from Tijauna, San Ysidro, La Plata Perdida, there are words she won’t ever truly understand. She will never really know how to speak the “call-and response patter” of semi-automatic weapons in Mexicali, or the stories of the guides leading her through an LA Gang Tour which are in danger of being drowned out by “the clattering machinery of [her own] guilt”. A guilt that anyone in a position of privilege is in danger of being paralysed by. So Jamison’s answer is to listen anyway, to work, to reach out. A sentiment which is in danger of sounding trite but in her essay ‘In Defence of Saccharin(e)’, Jamison addresses this fear of earnestness by suggesting that after something so sweet we respond as if soured, and that this is a place which reveals: “If the saccharine offers some undiluted spell of feeling…then perhaps its value lies in the process of emerging from its thrall: that sense of unmasking, that sense of guilt”. Once again we are opened up. Across the essays within The Empathy Exams Jamison situates herself in the tract between, exploring the ways in which we can stretch the limits of ourselves to be, to know and to understand. She burrows deeply into her own experiences and those of others unselfishly, and her writing is often so energetic it requires breaks to regain the breath. Jamison seems incredibly motivated by the power of empathy and the frustration felt when it is absent; so reading this collection within the current political context is both energising and exhausting as she makes a call for more open-heartedness. Because it’s not easy; this openness could be so easily understood as indulgence, or with the wetter, less rigorous notes of sympathy ringing out that make this very cynical, very British reader want to move back and away from Leslie Jamison and towards her subject. But this is what it means to empathise openheartedly; it is a vulnerable, uncomfortable state. It speaks to a broader idea of what we value culturally when we examine ideas, where stories of female pain are “always news” because “we’ve never already heard it”. Because of this, the essays where Jamison directly addresses the physicality of women’s experience, their bodily interactions with the world, become the most compelling contributions to this collection. Posted in Reviews and tagged Book Review, creative non-fiction, essayists, essays, Leslie Jamison, non-fiction, nonfiction, reviews, the empathy exams. Bookmark the permalink.